I feel like this is the winter of soups and stews. We have over 3ft of snow on the ground here at the farm and we’ve spent late nights plowing the driveway, shoveling snow off the greenhouse roofs and digging out the chicken coop (multiple times!). It’s been the most snow we’ve ever had to deal with at the farm and while it’s beautiful to look at, it sure is a pain to deal with. The good news is that all of this snow is good for our irrigation and hopefully the harsh winter will kill off a lot of the nasty bugs that give us a lot of grief all season long. Fingers crossed! This soup has been our reward after cold evenings out in the snow. It is a lovely way to celebrate an often time overlooked vegetable–celeriac–that crazy, knobby looking root vegetable that’s usually the hardest thing to sell at the farmers market. I totally understand why folks shy away from this root (it took me 2 seasons of farming before trying one–true story!) but honestly, it’s one of the most versatile vegetables out there. It has a subtle flavor that lands somewhere between parsley and celery with a hint of nuttiness. It’s great when shaved thinly and added to salads, or cooked and mashed like potatoes. However, my favorite way to enjoy it is when it’s pureed in a soup. 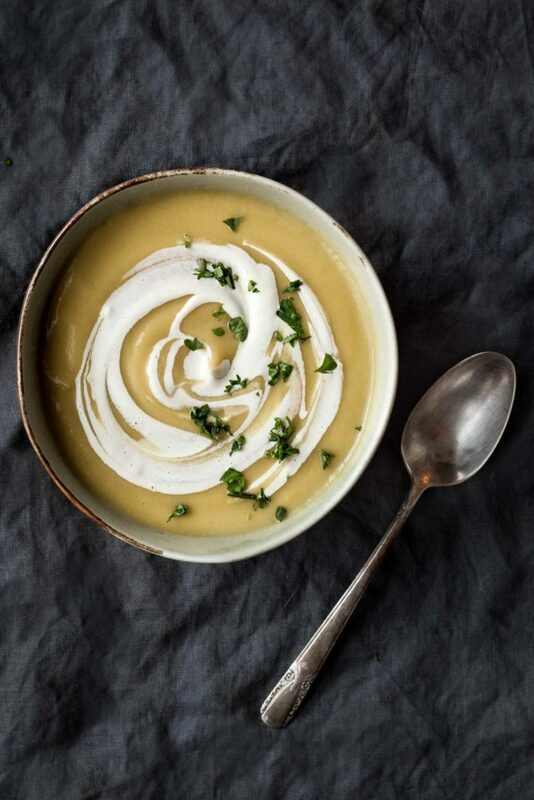 The recipe below is a great one to try if you aren’t familiar with celeriac. However, if you’re already a fan I don’t have to convince you that the ingredients below all go together really well. Grab a spoon and enjoy! This recipe is inspired by a soup that I enjoyed over the holidays with my mother and sister-in-law. Charlotte and Jamie–I think you’ll like this! Heat the oil in a large heavy bottom pot over medium high heat. Add the leeks and onion and cook, stirring occasionally for about 8 minutes. Add the garlic, celeriac, potato and salt. Stir well. Add the stock and bring to a boil. Reduce the heat to medium-low and simmer until the vegetables are tender, about 25 minutes. Remove from the heat and let the soup cool for a few minutes before transferring the soup (you may need to do this in batches) to a high speed blender and pureeing until completely smooth and creamy. (You can use a stick blender here but the soup wont be nearly as smooth and creamy.) Return the soup back to the pot, stir in the lemon juice and taste for seasonings. If the soup seems too thick add more stock or water. Keep the soup on low heat until ready to serve. Serve with a drizzle of cashew cream, Crème Fraîche, or plain yogurt and minced parsley. Your post made me smile. Where I live a piece of celeriac combined with carrots, porree and parsley is part of every traditional cooked soup (vegetable soup, chicken broth and beef broth). Always wondering what to do with celeriac! It’s one of the only things I’m getting at the farmers market now, I will pick up some leeks and try this! Sounds great. Will give it a whirl. Might also try with spicy carrot and parsnip. Fresh recipies delivered to your inbox! All content copyright © 2019 Dishing Up The Dirt Inc.